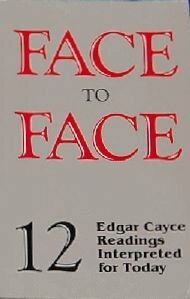 Face to Face: 12 Edgar Cayce Readings Interpreted for Today - The timeless wisdom of Edgar Cayce psychic readings is presented for you in this special collection of commentaries from the popular Face to Face home study series. Twelve of Cayce's best readings will spark your interest in such topics as: The Mission Of The Soul - The Laws of Spiritual Healing - Fulfilling Your Ideals In Life - Developing Psychic Ability --- With each chapter you will gain rare insights as you experience an entire Edgar Cayce reading, as though it were given just for you. Along with each reading, some of the best-known speakers and authors at A.R.E. provide a commentary giving step by step interpretations of important ideas. Each chapter invites you to see life in a new way and shows you how to use your new perspective in practical application to daily living.